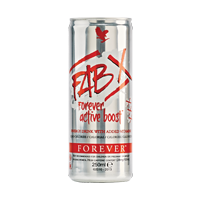 Naturally flavoured with delicious berry undertones, FAB X has all the benefits of regular FAB but without the calories, carbs, or sugar. This zero-calorie energy drink contains vitamins and nutrients and is perfect for those who enjoy sport. Carbonated water, acid (citric acid). Stabilized Aloe Vera Gel, acidity regulator (sodium citrates, potassium citrates), taurine 600mg/250ml, acid (malic acid), Guarana seed extract, glucuronolactone, flavour, L-glutamine, herbs blend (Eleutherococcus S., Schisandra), inositol, sweetener (sucralose), vitamins (B3, B5, B6, B12), colour (carotenes).